When you make a large pressure cooker full of soup, a roast with vegetables, fish, rice and chicken, or a big delicious dessert, you might want to store it overnight and have the leftovers the next day. If you made chicken vegetable and noodle soup, it’s best to use it the next day or freeze it. If you have an older aluminum pressure cooker, you cannot store food in it overnight. Aluminum leaches into your food and that’s not a good thing. We try to avoid aluminum but it does not cause Alzheimer’s that was communicated to us over 20 years ago in magazines, advertisements, and television. We’re exposed to aluminum daily. Aluminum is in rocks, minerals, clay, and the soil where you plant your vegetable garden and no one has died yet from soil-grown plants or farm animals eating grass from the soil. Lesser amounts of aluminum are found in vegetables, fruit, and meat whether they are organically grown or not. 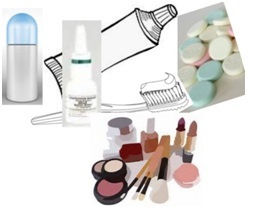 Aluminum is in buffered aspirin, toothpaste, nasal spray, deodorant, antiperspirants, some antacids, some cosmetics, processed and pickled foods. The 1- to 10-milligrams of aluminum we ingest each day is nothing to the amount we consume from an aluminum pot, skillet, or pressure cooker to prepare dinner. Tomatoes cooked in aluminum for 2 hours then put in the fridge overnight had a mere 0.0024-milligrams of aluminum for a cup. One antacid tablet might have more than 200-milligrams of aluminum. That’s about to give me heartburn. This is strong, lightweight, and a good conductor of heat and is not expensive. If you’re still concerned with aluminum leaching into foods, toss out your old thin, pitted, and bent aluminum cookware. Replace those with anodized aluminum that has been sealed with a special coating to make the aluminum more dense, harder, nonstick, and nonreactive to certain foods, such as tomatoes. 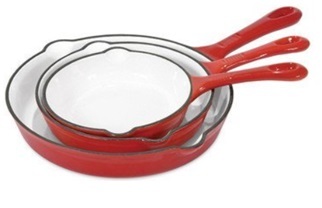 If you have old aluminum skillets that stick no matter how much grease or oil you put into them, opt for porcelain, enamel, or ceramic skillets shown here. 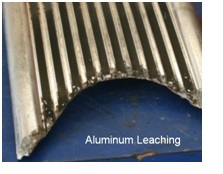 The amount of the metal aluminum leaching into food from cookware is contingent on several things. Foods high in acid such as canned or fresh tomatoes, tomato sauce, and tomato paste will cause more of the aluminum to leach out contrasted to foods with lower amounts of acid. Rhubarb is a high acid vegetable that we treat as a fruit adding sugar and strawberries for a delicious pie. Of course, meat and poultry have low acid. I would never store chicken soup or tomato-based dinners in any type of aluminum pot in the fridge whether it’s anodized or not. Why? Because grandma said not to and I believe in her still today even though she’s left me. Of course, she passed that tip on to her daughter, my mother, and I believe her too. Contact with aluminum foil and aluminum pans can give you about 3.5 milligrams of aluminum each day if you cook in that cookware daily. The toothpaste we use after dinner to clean our teeth has aluminum too. I store all my pots of food in the fridge if it’s made from stainless steel—even my stainless-steel pressure cooker minus the inserts. 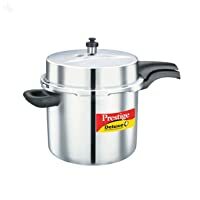 I have the Prestige® Smart Kitchen model number PRDA10 stainless steel pressure cooker and love it for storing soup in the fridge to put on the stove and heat up for lunch the next day. The base with magnet can be used on electric, gas, propane, and induction cook tops—and go into the fridge. This is what sold me: Stainless steel is an alloy, a mixture of metals,used in this pressure cooker of heavy metal of 18/20 stainless steel meaning it has 18% chromium making it shine like a diamond with 20% nickel. Chrome and nickel make it last longer. Chromium prevents rust and stains. Stainless steel pots and pans are almost perfect. They are chemically stable, meaning they won’t react or leach acids from tomatoes, have a shiny gleaming finish, not porous, maintenance free, resist scratches and dents (unless you beat it with a hammer) and do not harbor stains. Most home use cooks and professional chefs swear by stainless steel and I do too! It’s best to use anodized aluminum if your choice is aluminum, but once you use stainless steel, you’ll never go back. The pressure cookers have cool touch handles and lids that clamp down for the pressure. Food is delicious, and you can store stainless-steel in the refrigerator. Be sure to let your food cool before putting in the fridge, however. Feel safe; aluminum is safe to use in pressure cookers and other cookware.